One of the first teardowns of Apple's iMac Pro shows that it is in fact possible to upgrade the RAM on the computer, though all but the most experienced people will probably want to pay a specialist. The Pro uses four quad-channel modules, in 8-, 16-, or 32-gigabyte assortments depending on whether buyers pick a 32-, 64-, or 128-gigabyte machine, a video by upgrade firm OWC reveals. While it's possible to boost RAM by swapping in new modules, as on a Windows PC, doing so requires disassembling virtually the entire computer, including a risky process to remove the display. In its default $4,999 configuration with 1 terabyte of storage, the Pro actually uses two compact 512-gigabyte SSDs joined together in a RAID configuration, something presumably needed because of the minimal space available. These can be unscrewed and removed, though finding replacements is unlikely, at least for now. OWC said that it will be selling RAM installations and even a do-it-yourself kit in the near future, but that given memory and labor costs —and the trade-in value of the 32-gigabyte option —it's best for most people to buy a Pro with sufficient RAM from the start. 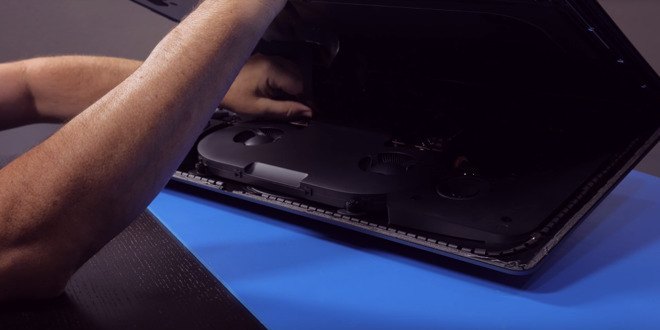 The company's teardown also offers a glimpse at the Pro's elaborate cooling systems, needed to cope with workstation-level hardware being compressed into the body of an iMac. The first iMac Pro shipments began arriving earlier this week. Check out AppleInsider's unboxing video, as well as our benchmark tests.